With over 10 years of restoration experience serving Chicago and the surrounding suburbs, our company has quickly become an industry leader in fire damage clean up. Whatever the size and scope of your fire, you can rely on our professionals to restore your property quickly and efficiently. Because life and Mother Nature can be unpredictable, it’s extremely important to react quickly when they strike. Regardless of your needs, we are ready to help you with your fire damage restoration 24-hours a day, 365 days a year. Once our experienced fire damage clean up response team has done the necessary emergency work, it will be time to rebuild the particular area of your property that has been damaged. While your home or business is being repaired, we will walk you through every step of the way to make sure that the transition back into your property is a smooth one. The restoration begins after the initial emergency response, pack-out, and cleaning. We will guide you through the entire process, and get you back in your property as quickly as possible. Whether you are in Chicago, Skokie, Lincolnwood, Morton Grove, Niles or anywhere in between, we are equipped to begin your fire damage restoration quickly. In most cases, the process will begin before your insurance company has issued any payments, and will be completed by our competent, licensed and insured contractors. 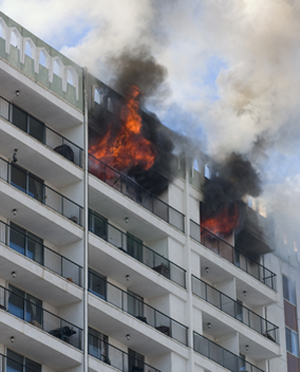 As a property owner, one of the most traumatic experiences that you can encounter is having fire damage in your home or business. If you find yourself in this unforeseen predicament, it’s extremely important to react fast and call the professionals at A-Emergency Services & Restoration for prompt, fire damage restoration service. Because appliances, fixtures and structures can be permanently damaged after a fire has struck, you cannot afford to wait. Whether your walls, ceilings, carpets or doors have recently experienced a fire, smoke or soot damage, we can provide immediate fire damage cleanup and ensure that our team of licensed professionals restore your property back to its original appearance. For fast action, call us: 773-529-6700.